Jubilee's rousing musical finale Jump to media player Members of the London Philharmonic Orchestra and the Royal College of Music Chamber Choir perform a musical finale to end a spectacular river pageant in London in honour of the Queen's Diamond Jubilee. Party time for royal revellers Jump to media player Thousands of parties are taking place all over the UK as part of celebrations to mark the Queen's Diamond Jubilee. 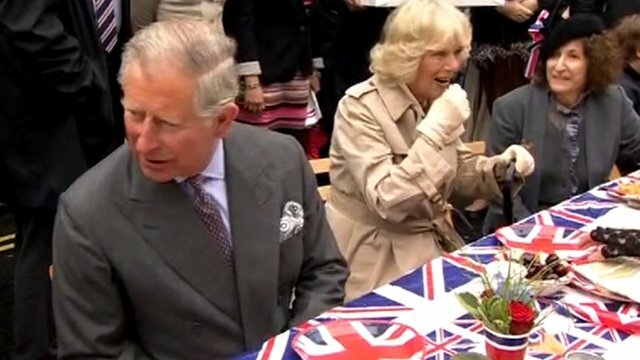 Surprise guests at Jubilee party Jump to media player Well-wishers greet the Duke and Duchess of Cornwall, who were surprise guests at a street party in Piccadilly, central London. 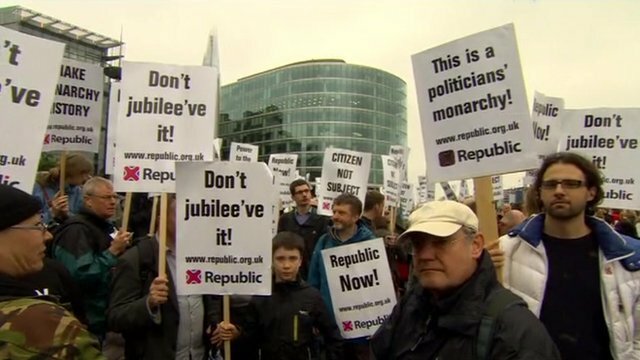 Republicans protest at Jubilee pageant Jump to media player Tens of thousands of people are lining the Thames in London hoping to see the Queen. Republican protesters have also turned out to make a stand. 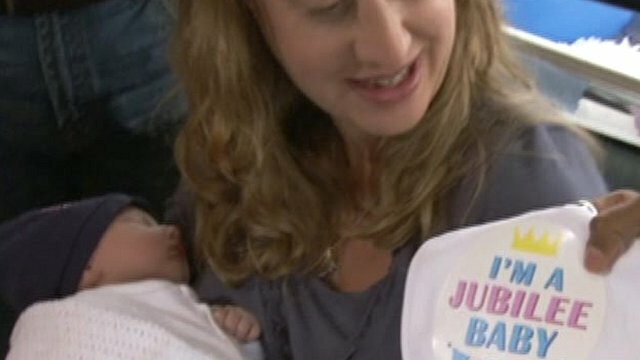 Jubilee babies born on pageant day Jump to media player As the Jubilee river pageant was in full swing, proud parents have been introducing their 'Jubilee babies'. 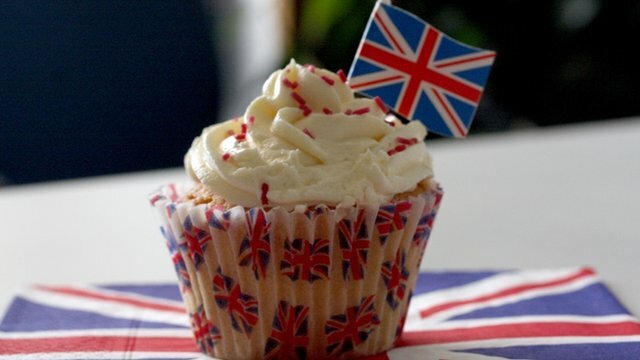 The Queen has led the largest river pageant in London for more than 300 years as part of the celebrations to mark her Diamond Jubilee. 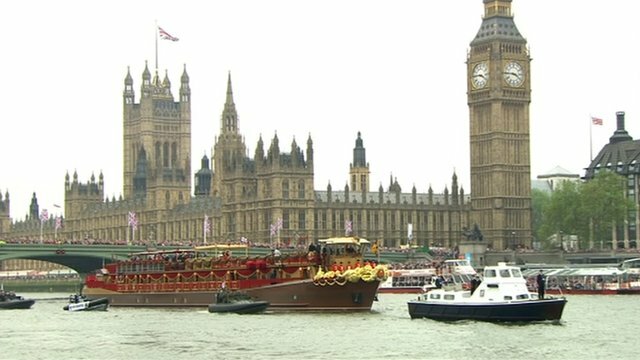 The flotilla included more than 1,000 vessels and set a new world record for the number of boats taking part in a parade. The final vessel to reach Tower Bridge was Symphony, carrying members of the London Philharmonic Orchestra and the Royal College of Music Chamber Choir. 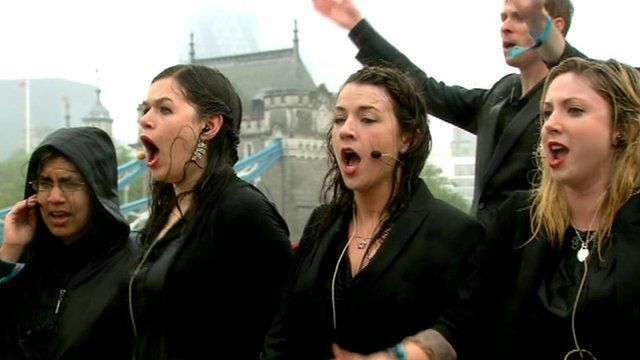 The singers got drenched by rain as they performed several songs to the Royal Family including Land Of Hope and Glory, Rule Britannia, and the national anthem. Fireworks were then set off from the top of Tower Bridge before the bascules of the bridge were lowered as many boats sounded their horns.